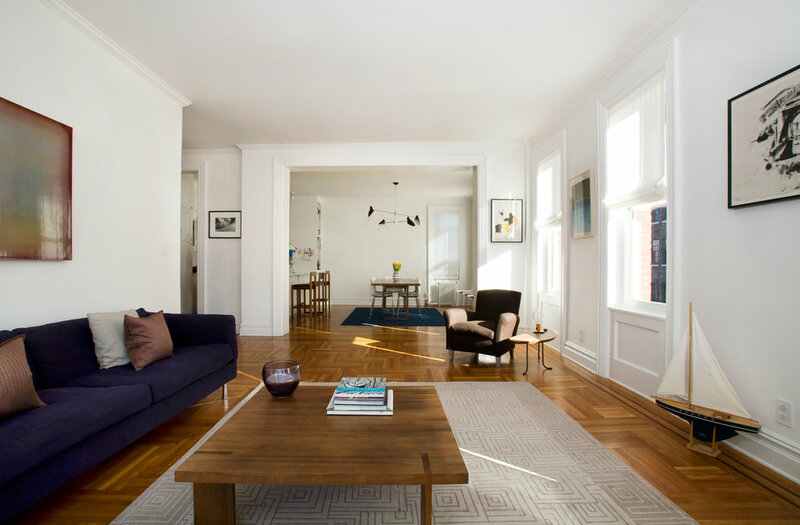 The Brooklyn Heights Prewar apartment is a two bedroom, 3 bathroom apartment located within a 1920’s, five-story, coop apartment building located one block from the East River in Brooklyn Heights, Brooklyn. The new owners required that the apartment be renovated to accommodate their appreciation of light and open living spaces while respecting the detail and basic scale of the original, classic three-bedroom apartment. During the renovation the living room with south-west exposed, corner windows was opened to connect with the dining room. The new, large opening was framed to match existing, original door frames throughout the apartment. The small, galley kitchen was opened into the dining room creating a more contemporary and open kitchen / dining room relationship. A walk-in closet and larger master bathroom were added to create a comfortable master bedroom suite. A third bedroom was turned into a family room / guest room with the addition of a storage closet and a nook for the television. Bathrooms were renovated, floors were patched and repaired, all windows were replaced.